Asura’s plot is based on Chinese mythology and featured leading actors and flashy special effects. Unless the film achieves much greater success the second time round, Asura’s $105m loss would make it one of the biggest flops in movie history. Loosely based on Buddhist mythology, the movie tells the story of a shepherd protecting a mythical heavenly realm from attack. Before its release, the film was showered with praise by state media, with the China Daily calling it the “most hotly anticipated blockbuster of China’s competitive summer season”. As China is expected to overtake the US as the world’s biggest film market, the plan for Asura was to kick off a major fantasy franchise akin to Lord of the Rings or Game of Thrones. 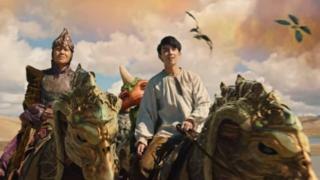 In the run-up to its opening weekend, financer Ningxia said they “wanted the film to raise confidence in our own culture and train more domestic talent”. Producers have reportedly suggested the poor box office showing was only part of the reason why the movie was pulled, and that Asura would be reworked and released again. While Chinese film productions have not typically had the same international reach as Hollywood films, there have been several China-Hollywood co-productions in recent years. One of the most high-profile was The Great Wall, which cost $150m, although it too disappointed at the box office.